Texas is one of my favorite states. Great people, of course, but I just love the way Texans collectively think. Though I spent some time in San Antonio, I didn’t have time to revisit the Alamo, but did get down around Goliad. I definitely want to budget more time to visit that part of the state when I get back next year. Outside the beautiful old county courthouse in Victoria, I spotted a deputy wearing a tooled brown leather duty belt and packing an ivory-handled 1911 pistol. In a world of black plastic service pistols in black plastic holsters, it was a refreshing sight for this old traditionalist. Hell, I was packing a six-shooter, myself. It was good to see SOME Americans enjoying prosperity. The recent developments in oil shale have been a boon to this part of the Lone Star State. It is pleasing to see a state that takes pride in its own rich history. During the drive, I found historical markers every few miles. Yes, it slowed me down to keep pulling over to read them…but it was worth it. I’m told that when Texas joined the United States, it did so with a written proviso preserving their right to secede if it didn’t work out. According to one source,the state can afford to; this source says that Harris County (Houston area) would, if autonomous, be the world’s fourteenth largest economy. 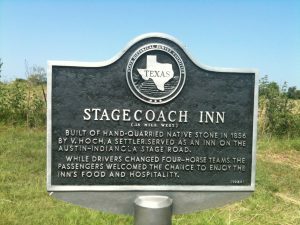 Historical markers dot the secondary roads…worth stopping for! 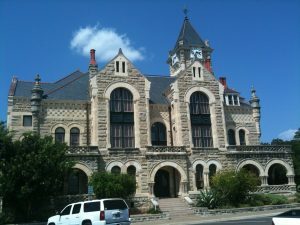 The beautiful old county courthouse in Victoria, TX. I have heard that all my life living here in Texas about the seceding question. I myself have found nothing the agreement between the Republic of Texas and the United States. We try once in 1860 and it did not work out so well. The agreement did allow Texas to split into 5 separate states though. I have high hopes for the survival and future greatness of our common American constitutional republic, so discussing Texas immigration issues is likely moot or at least premature. I suspect you could amply demonstrate that you are of good character, willing to be gainfully employed, would be a conributor to the greatness of our state, and you ” Think like a Texan”. What does it mean to think like a Texan? The town of Gonzales had a cannon used for defense against Indians. The local Mexican military commander, under orders to disarm the people, announced that he was going to seize the cannon. Hearing that the troops were on the way, the Gonzales militia formed up on the town square with their rifles and muskets ( and the cannon ). Their formation was marked by a blue and white flag emblazoned with the silohouette of a cannon barrel and the words ” Come And Take It”. Thus did the free men of Gonzales greet the troops who arrived. The lancers , used to dealing with unarmed peasants, decided that this was a horse of another color , and they left for healthier pursuits – without the cannon. That’s ” Thinking Like a Texan”. Come to think of it, it is also ” Thinking Like an American”, just like at Lexington and Concord, although sadly, that sort of thing is frowned upon now in Massachusetts. As for Texas – you would be very welcome – in fact, even under the present circumstances, if you decide to move here, you would be more than welcome. Welcome to Earth. Come back soon. The “Texas can secede at will” concept is incorrect, although often cited. What the State of Texas does have the right to do is to break up into 4 additional states. And if it did, I seriously doubt that the “intended consequences” would take place. We would be moving into totally un-trod and unforeseeable territories. Thanks for the kind words about Texas. You’re always welcome here! Glad to hear you’ve gotten well. P.S. I just finished “In the Gravest Extreme”. It was an excellent read and I couldn’t put it down. Thank you for the kind words about our fair state! Glad you’re better, and there are a LOT of BBQ gun 1911s still being carried by Texas LEOs! That is a beautiful area too! On behalf of my fellow native Texans, I welcome you to immigrate to our republic; the LFI-1 class you taught in McKinney in 2000 remains the best specialized training experience of my life. I agree completely; the San Antonio area is quite incredible. If Texas were to secede, I would gladly beg for citizenship (and for a spot on their border patrol team). Glad you are feeling like your old self, Mas. (Maybe that didn’t come out right). Mas, we’re glad to have you in Texas and pleased you tolerated our heat. I teach near Huntsville, TX and several local law enforcement officer’s presented our teacher in-service on child abuse and proper reporting procedures yesterday. I saw plastic on one out of five, three 1911’s, and a revolver. On the negative side, we lost a fine officer in College Station on Monday, 8/13. Constable Brian Bachman was killed while serving an eviction notice near the Texas A&M campus. One other gentleman was killed and a lady was critically wounded by the gunman before he was killed. I’ve included a link to our local TV station which has an account of the event and a site for those who wish to pay their respects. It is also my understanding that the man who filmed the segment shown was an army medic who, after the police cleared house, rendered aid to both Constable Bachman and the shooter. If Texas seceded (please do it!) I’d be all for moving there. Texas needs to be its own country; my personal opinion is that the current union is simply too large. Heck, even with the current union, I wouldn’t mind living there; I have a friend in the coastal area, which looks quite pleasant, with lots of open land. Bless that deputy for having such fine taste. Greg Tag, I find it somewhat strange that most of the thirteen states where our freedom was won are trying so hard to lose those freedoms. That’s one heck of a stage stop! Glad to hear your feeling better. A friend of mine (from Florida) tells people when they ask him where he is from: “Texas, I just haven’t gotten there yet.” Hill country is one of the fondest memories I have of anywhere in U.S. Mas, pick a town where there are USPA and IDPA clubs within 45 minutes and we are coming with you. Good to hear you are doing better, Mas. My only time in Texas was a hunting trip many years ago. I was in a body cast at the time so I didn’t get a deer. (long story) But the people were pleasant and even wondered why I didn’t go out at night and stake out one of the feeders the ranchers had! 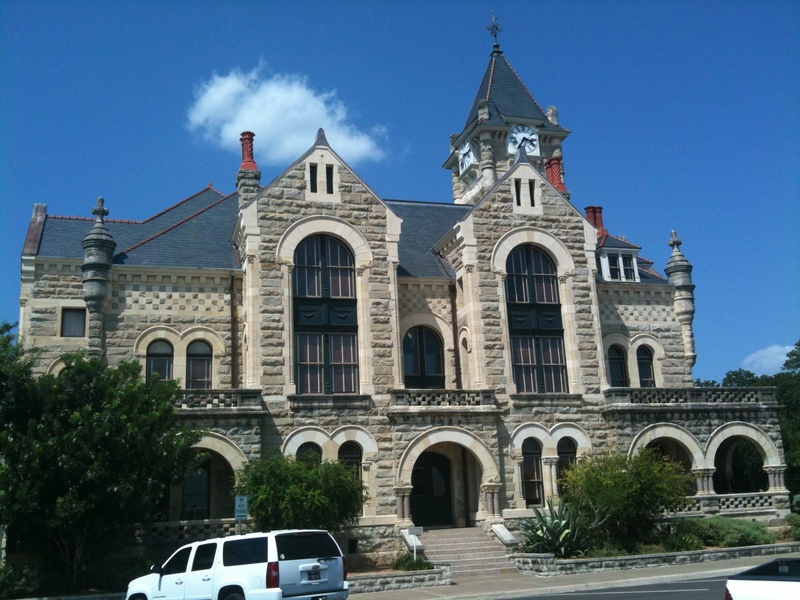 That is a fine old courthouse, we used to have one similar in our town, but the yuppies had to have something more modern. So, that old court house was torn down and a monolithic monstrosity was put up that is starting to fall apart. Oh, and Cook County needs to secede from Illinois. Glad you love our state. I find it isn’t uncommon to see an old school LEO (especially Sheriffs) with nice leather rigs and 1911s. The amazing thing is they can actually shoot, too. Mas, I am pleased to hear that you enjoyed our great state. Part of what makes Texas so enjoyable is our liberal reservation aka Austin. So long as most of the lefties, hippies, peaceniks and commies are congregated there, the rest of the state can enjoy prosperity and freedom. Had a small farm abour 20 miles SE of Fort Worth and retired to Florida 8 years ago. I lived there with the city yuppies for 2 years and 10 days. Moved back home to Texas 6 years ago and will never leave. Folks are right about Texas having the right to seperate into several states, but nothing in the agreement gives Texas the right to secede. I also note the Constitution of the United States which is a document limiting the power of the Federal Government (Not the Citizens) has no clause which prevents ANY State from seceding. If anything the clause “All powers not specifically granted are reserved to the States and people” might be considered as a legal right for any state to leave the union. God bless ALL Red Nation – especially ALL the South. Sorry Mas but the secession question was settled with powder and lead in 1865. I don’t agree with the outcome, but I don’t think it’d be worth the cost to try it again. Best to work to fix the union we have, in my opinion. I lived in Texas for two great years. But I think the state I currently live in, AZ, has the TX gun culture beat. Open carry is common and generally supported. Concealed carry is allowed for all adult citizens as a matter of cource without need for a permit or license of any kind. Hard to beat. Ralph, I don’t think our current union can be fixed. The regional political beliefs are even more utterly different than they were in 1861. California’s borderline Communist, New England is a socialist hellhole, and Illinois is just plain bad. Vermont is flaming liberal with an extreme hatred of “bigness,” be it big business or big government, New Hampshire is libertarian-leaning but small, Alaska is self-reliant, with an extremely independent spirit, most of the South is conservative Christian with both libertarian and liberal streaks, and Texas is, well, Texas. It just doesn’t make sense that Texans should have a say in how New York is run, or have Californians tell North Carolinians how to behave. Alaska, Texas, and California all need to be separate nations, IMO. New England could form its own union, and the South could become a better Confederacy. The rest of the states could join who they felt agreed best, or form their own confederacies. Then we could all cut DC out of the ground and have it shipped over to Europe. Makes me want to go there. You’re a one-man tourism department! Glad you feel better — we need you healthy! Mass, here’s a book you can take with you when you come back to visit. I keep meaning to put my copy in the truck so I can get a date and photo of when I visit each courthouse. We lived in New Mexico for 15 years before moving back and I could have got severa “notched” if I would’ve kept it with me. Some wonderful old buildings in the small towns. Mas – Glad you stopped by Goliad. While the Liberty Bell means a lot to many US citizens, I have to say that Goliad ranks higher on my list of somber thought-provoking sites. The Goliad massacre was at the start of the Texas revolution and why the battle cry at San Jacinto was ‘Remember the Alamo- Remember Goliad’.